High Quality Content by WIKIPEDIA articles! 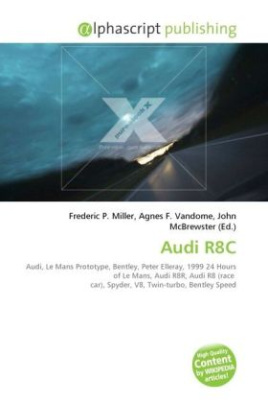 The Audi R8C was a Le Mans Prototype built by Audi for the 1999 24 Hours of Le Mans designed by Peter Elleray. It was developed alongside the open Audi R8R spyder, prior to being replaced by the all-new Audi R8 in 2000. At the time of Audi's announcement of their intention to enter the 24 Hours of Le Mans in 1998, the initial plan was to enter an open- cockpit prototype, known as the Audi R8R. However, following the dominant performance of GT1-class cars in the 1998 24 Hours of Le Mans, the Automobile Club de l'Ouest (ACO) modified classification rules in order to create a new class known as LMGTP, which would be closed-cockpit prototypes, realistically replacing the powerful, purpose-built GT1 cars. Following this rule change, Audi decided that they should invest in this new LMGTP class, thus forcing them to design a whole new car, vastly different from the R8R. With the aid of Audi's new engineering partner Racing Technology Norfolk (RTN), Audi designer Tony Southgate set out to design the new R8C, unlike the R8R which was built by Dallara.